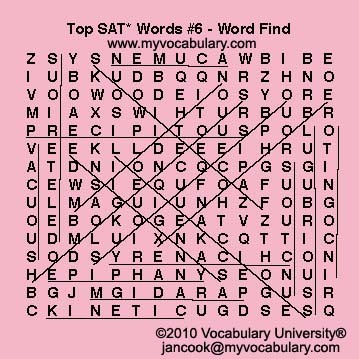 An SAT and ACT test prep word list for the Word Search Puzzle #6 is given alphabetically. The 18 words come from the 252 SAT and ACT test prep vocabulary word list. You can access the complete test prep list from the Test Prep header above. Vocabulary words can use common letters. Words can go in horizontally, vertically or diagonally AND forward or backward. 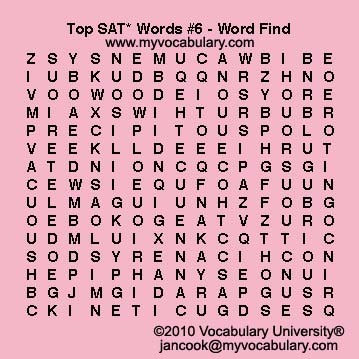 In addition to this Word Search exercise for SAT and ACT #6, www.myvocabulary.com also has a free Interactive Word Puzzle, Fill-in-the-Blanks, Crossword and Definition Match activity. You have permission to make a hard copy for further vocabulary study at home or in the classroom.